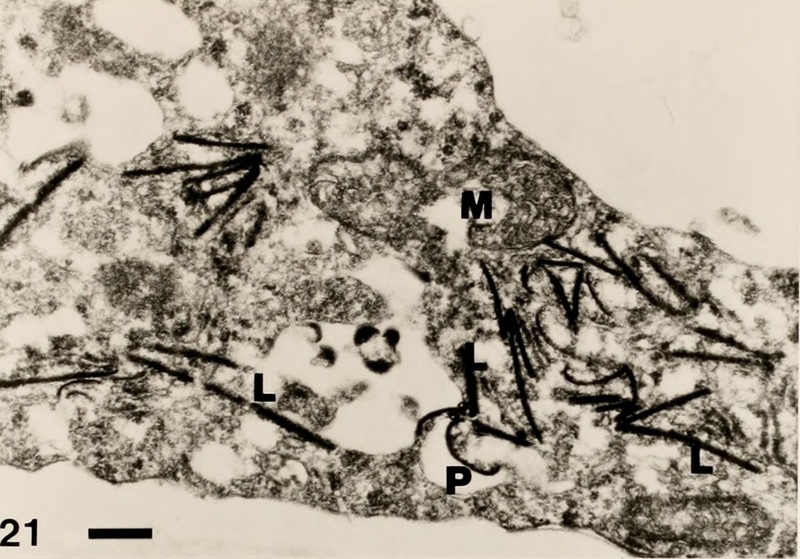 Electron micrograph of a human cell infected with SCP-3105. Special Containment Procedures: Samples of SCP-3105 are to be stored in a liquid N2-cooled storage container. Testing with SCP-3105 is to be subject to standard precautionary procedures for virulent pathogens. Note that SCP-3105 constitutes a Class A, UN 2814 biohazard. Description: SCP-3105 is a neurotropic virus, exhibiting morphological similarities to Rabies lyssavirus. SCP-3105 is able to infect almost all animals to some extent, though the infection it causes is asymptomatic in non-human hosts. SCP-3105 can be transmitted by airborne particles, bodily fluids, or an animal vector1. In humans, SCP-3105 enters the bloodstream and infects neural pathways. It travels through nerve axons via retrograde transport to reach the central nervous system, in a manner very similar to R. lyssavirus. However, the transportation stage of an SCP-3105 infection occurs over an extremely short period. Symptoms of infection will begin to present themselves an average of 5 days after contraction, though this value varies wildly, depending on the location and mode of initial infection, from 2 hours to 14 days. In addition, SCP-3105 targets Type II alveolar cells, causing minor shortness of breath and allowing airborne infection. Note that SCP-3105 is largely asymptomatic during its transport stage, though it is still present in the bloodstream, and remains infectious. Once SCP-3105 reaches the central nervous system, it will target the medial temporal lobe2. It will infect and destroy neurons involved in this process over the course of two days. The method by which SCP-3105 identifies target cells is unknown, and presumed to be anomalous. Symptoms at this stage of infection include anterograde amnesia. After destroying much of the medial temporal lobe, SCP-3105 will infect peripheral glial cells that are left behind, allowing it to remain dormant in the central nervous system for up to 3 months. In the final stage of infection, SCP-3105 targets parts of the temporal lobe assigned with semantic and episodic memory. This results in severe retrograde amnesia, resulting in inhibition of basic cognitive functionality. The final stage of SCP-3105 infection lasts between 5 and 19 days. SCP-3105 infection also triggers the secretion of cytokines3, deactivating cytoxic T-cells and preventing an effective immune response. This mechanism also prevents artificial attempts at preemptive immunization. Recovered autobiographical text from an SCP-3105 victim seem to indicate the retention of some memories, despite the observed destruction of the tissues required to store and consolidate this information. Furthermore, the information presented in the text seems to be shared between several individuals. Testing with SCP-3105 has failed to show evidence for this phenomenon. Initial samples of SCP-3105 were collected after unidentified GOI activity in the area surrounding Spruce Creek, Colorado, and the subsequent radio silence from the town. Much of the local population, as well as local insect populations, were found to be infected with SCP-3105. Armed Response Force Omega-6 was mobilized with the express purpose of destroying all SCP-3105 instances using incendiary munitions. The resulting wildfire was allowed to burn until noticed by firefighting services in the region, and was explained as an accident involving Spruce Creek's stores of emergency gasoline. The following is a series of notes collected from the forest surrounding Spruce Creek. Monospaced text represents physical notes4, whereas standard text represents unsent messages and journal entries recovered from an abandoned mobile phone. The material has been ordered chronologically, based on digital timestamps, location of recovery, and chemical dating. A search for the apparent surviving SCP-3105 victim has been initiated, but has yet to produce results. The light falls in shafts through the fringe of trees that covered the mountainside. It has a soft, yellow glow. It plays across the dirt and grass, dancing to and fro. The air is filled with the songs of insects and birds. I’m not sure why I’m in the mountains, and I can’t remember driving here, but it’s nice. The cabin’s fully stocked with food. I think I’ll stay here for a while. It’ll be good for all the stress. In the meantime, it looks like my kayak is still in serviceable shape. I might take it out for a run tomorrow. The sun wheels through the sky, dragging the shadows behind it. It seems to tarnish the firmament, turning the polished silver, yellow, then a blazing red. The mountains put out the fire, and the stars peer out from the endless darkness above. The river is wild, higher than I’ve ever seen it at this time of year. Maybe it’s the unseasonable warmth? My kayak sustained some damage, so I don’t think I’ll be taking it out again until I can get back to town and repair it. I think I’ll take my time though. The hummingbirds are very pretty. The bulb draws strength from within itself. It bursts from the ground with an abated ferocity, turning green leaves into the ever-wheeling sun. It clings to the loamy earth and finally creates a single crimson blossom, boldly stating its intent to the greater world. Then it withers in the cold winds. I woke up in the cabin today. It’s a little unusual, but I understand the allure. It is beautiful out there. The yellow aspens are quite a sight. I think I’ll stay here for a while and destress. From the Cornell Lab of Ornithology: The Calliope Hummingbird is the smallest long-distance migrant in the world. It will travel 5,000 miles each year from the breeding to wintering grounds. It migrates north along the Pacific Coast in the spring, but returns to the wintering grounds in Mexico via an inland route along the Rocky Mountains. It looks like there’s a big wildfire to the east. They say the fire season gets longer every year. I noticed today that my kayak’s been scuffed up really badly. I took a look at the locks and I didn’t notice any obvious tampering. I’ll check the windows tomorrow. A neuron is composed of a soma, dendrons, and axons. It forms the primary unit of the nervous system in all living beings. The clouds roll across the open plain and clash against the towering mountains, turning dark and angry. Thunder echoes through valleys. Photoreceptor cells are stimulated by a structural change in the protein retinal. The cell is then hyperpolarized, triggering an action potential in connected neurons. It’s loud. The fire is getting closer. The smoke is irritating my throat. I tried to start the car earlier this morning, but it just sputtered. Diagnosing the problem will take too long. I’m heading out on foot tomorrow. Fire is rebirth. It clears the way, erases the old growth and making room for new shoots. In a few terrifying nights, it ravages its way through everything, bringing even the greatest of giants to their knees. Then there is only ash. But soon the cold winds blow, and bring the dormant seeds of distant places. The land flourishes anew. I’m not sure what’s going on. I woke up choking on smoke. When I ran outside, the sky was on fire. I’m hiding under a rock, hoping to wait it out. The night is dark. The valleys below are filled with fireflies. The chop of the rotors shakes the soles of my shoes. The cold wind slaps at my exposed cheeks. In my hand is a plastic syringe. It sure is cold. The rain is coming down pretty hard, but if I follow this road, I should get somewhere nicer. Right? The mountains stand in the hazy distance, a dark silhouette against the soft pastel colors of the sunset. Wispy clouds sail by above as the car thrums away, into the golden plains. No trees, no concrete, nothing at all. There is no smoke in the air. The cold wind takes it all away. There's a road here. I guess I should follow it. Could you come get me? I'm in the middle of the forest. What's going on? I need help. I think I'll follow this road. Why do all the trees look the same? Rabies has a 100% mortality rate. In the last trial, it worked too fast, killed the subjects outright in less than an hour. We'll need to reduce its affinity for acetylcholine receptor complexes, maybe put in a timed-self destruct mechanism so that it doesn't go too far. I'm hungry, but I found some edible berries. It's starting to feel better. This road seems like a good bet. Huh. I don't remember sending all these messages. Are they coming through? Trial 104, Human subject 34, Results: Initially positive. Sudden stroke followed by death after two days. Trial 230, Large scale application 1, Results: Very positive. Production of emergency amnestic compound authorized. It won't hurt one bit. Just don't look. If anyone finds this phone, I need help. I'm leaving it on the side of this road because it's about to run out. I'm going to the lights, there might be a town. Back and forth. Eyes in a empty helmet. They tried to fight. Too late. It's always been too late. The night was very dark. I'm not sure how it happened, but we messed something up. I got a scrape, a mosquito bit me, I don't know. They left me behind, in the middle of the forest. The screams of the town filled the night as they were reborn, again and again. The cold wind whistled through the tops of the trees. The xylem is the tissue that carries water. The phloem is the tissue that carries sugar. Transpiration allows trees to go taller than they should. No it doesn't. I can't remember. I can see more. I lost some, but now I can see so much. 1. Especially human ectoparasites, animals that consume human bodily fluids. 2. A cerebral structure assigned with recording declarative memory. 4. Earlier notes were written in charcoal on paper, while later ones were cut out of tree bark with a knife.